This month our school will be embarking on a special project, a district-wide book club called One County, One Book. Every family will receive a copy of the same book – Betty G. Birney’s School Days According to Humphrey – and will be asked to read it together at home over the next few weeks. Please make the time so that your family can participate in this special activity. Reading aloud at home is valuable because it better prepares your child to be an effective reader, and it is also a fun, worthwhile family activity. With the One County, One Book program, we aim to build a Community of Readers throughout our entire county! Everyone – students, parents, teachers, even administrative staff – will literally all be on the same page. Your child will receive a copy of School Days According to Humphrey at a special gathering introducing the program and the book. Along with the book, you will receive a reading schedule so that you can keep up at home. Generally, you will be asked to read about 15 minutes each night. In school, your child will be invited to answer daily trivia questions to encourage and reward attentive listening. You will soon find that your child will take pride in knowing and anticipating the details of the story. In class, students will explore the book through activities and discussion. You will want to make sure your family keeps up so that your child can be included. Throughout the month, everyone will be talking about School Days According to Humphrey! One County, One Book is a novel program in that children of all grade levels will all be listening to their parents read same book. Strange or daring as that may seem, it actually makes sound educational sense. Reading professionals recommend reading material out loud that is beyond a child's own reading level. We also believe that you can and should continue reading chapter books with your older children, even when they are able to read by themselves. We have selected a title that can be followed and understood and enjoyed by younger students, but will still captivate and stimulate older children. I know that you’ll enjoy this special reading time with your children. 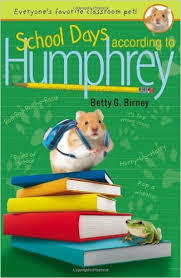 I hope to talk with both you and your student sometime this month about the further adventures of Humphrey – everyone’s favorite hamster – and his positive influence on the students of Room 26. "When a whole county reads a book, there's a lot to talk about." With your help, we can build a Community of Readers in our county.